Although there are no big bugs, the user interface needs sanding and polishing to finish. I’ve got ten outstanding bugs on my list for this product and once those have been swatted, I’ll open up the beta program a little bit further. (Thanks to all who have registered their interest, I’ll be in touch very soon). Without further ado; teaser screenshots. These are not mock-ups and the results are running from a genuine “test product”. This is where the product is currently, but please bear in mind this is a pre-release screenshot and the quality of the product will improve by release. 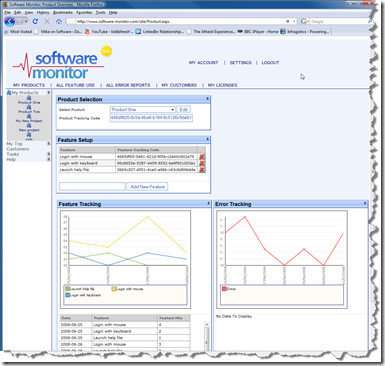 Once logged into software, an overview grid is shown showing the total number of feature requests for all features for today, yesterday, this week, this month and a grand total. Figures are also shown for the quantity of errors reported in these time frames. 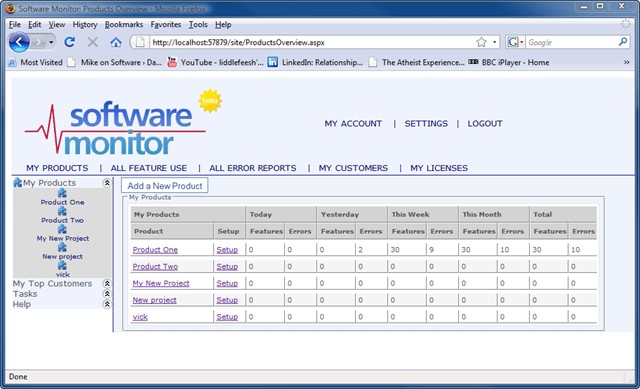 When clicking a product, the user is shown the product detail page which shows the respective popularity of features over a default time range (custom date range selection is developed but not yet shown on these screenshots). 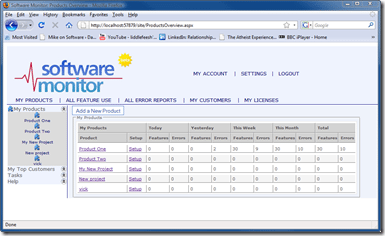 Also shown with the charts are summary data grids which show the data in a tabular format. It is possible to also drill down into these statistics to show detail of each of the errors that was logged and in the near future; receive automated error reports and weekly/monthly summary statistics by email. Also included is basic CRM functionality so that the system can be made aware of who your customers are. By reporting the tracking key for a specific customer it is possible to view the feature use and error tracking statistics on a per-customer basis. Also in development (but no UI yet) is the licensing system which allows you, the developer, to provide a list of valid or blacklisted serial keys and an easy to use API through which you can check the status of these keys in real time. This mechanism can be integrated with most of the popular payment processors and resellers in order to provide an extra degree of security for your software. Various key properties and expiry dates are also provided, as is support for subscription based modelling. The user interface is currently under heavy re-development and I want this to be mostly in place prior to the beta test period. Once beta has been “signed off”, we’ll make a public release and start working on adding all the new and wonderful features that have been suggested (keep the suggestions coming, please!). I’m sure every developer can associate with me when I say that software is never finished. There’s always something else that needs to be added or a feature or logical bug just sparks in your brain while you’re working on something else. That’s the moment you realise that even the best plans of mice and men are fallible and you’re grateful to yourself for planning a solid database schema from the start. For example. I’m in the UK. Almost all my company’s assets are here in the UK too, with the exception of the dedicated server which I have for the production software in Canada. When I’m testing (and beta testing) in the UK, everything works well. On Monday I moved everything across to the production server and tested logging a few feature hits and error reports. Something weird happened; the error reports and features weren’t being added to today’s statistics. It seemed I had forgotten to implement a time-zone adjustment option within the user profile. So these new changes get added to the bug tracking spreadsheet and another full day to implement and test needs to be added to the schedule. Internet Explorer and Firefox. I needn’t say more than the rendering differences between these two browsers is astonishing. I’ve had a lot of issues getting consistent with both browsers. I think I’ve nailed them now but one issue remains: Firefox shows two blue bars on the top and bottom of the login form where Internet explorer only shows one. Slightly frustrating. I’m also tempted by the non-conformance of Internet Explorer to do some very cool things. For example, if I could guarantee that everyone used Internet Explorer I could use the right mouse button to display a context menu, just like a desktop app. That would be very cool as I could make the pages cleaner and a little less cluttered. But I can’t, so scratch that idea. Maybe I’ll write a desktop application which interfaces with Software Monitor and gives you rich data visualisation for the desktop. My dedicated hosting provider, NetRackServers, gave me seven days notice that the server will need to be physically moved to a new data centre next week. Part of this process involves issuing a new public IP address which means that all the DNS records will need to be changed and the site will go down for maintenance outside of UK office hours. This is rather annoying given the cost of hosting yet apparently it cannot be helped. Still, I cannot have such disruptions in the future so I’m looking for a new dedicated hosting provider to place future business with and so I’m looking for recommendations. It seems I’m in good company with not releasing at the end of a month, although a release in July looks good for almost everybody. Steve Cholerton (SMSRelay) added screenshots, and so has Philip (misvCRM) and Project Iffy. Others have checked in with status updates such as Rafael, Susan,and the Runimal project. But a big hip-hip-hooray to Steve McLeod who released Poker CoPilot on the 30th June at 8:43pm. No doubt he’s going to take a well earned few days off. Scott Kane wins the “Most prolific blogger” award, with a post on nearly every one of the 30 days. I don’t know how he does it! There are a good deal of other authors who have been taking part in this challenge. I recommend viewing the combined feed to get a taste: http://feeds.feedburner.com/30dayers. That’s all from me for now. I’m still working as fast as possible to get through the pre-release alpha stage and to a point where you can all get your hands on it. It won’t be long, I promise! Regarding blogging daily. It’s how I unwind. I use it to detatch myself from coding, so I’ve found it actually serves a worhwhile purpose in terms or R&R. For hosting, check out gogrid and mosso. Both offer very scalable solutions that virtualize away the hardware so you don’t need to deal with any of that meatspace crap. ProjectIffy – GoGrid looks excellent. I’m very intrigued by these cloud processing solutions. I’m going to take a serious look at these towards the end of this year. Depending on how successful this service is.